The Musical ensemble at Shankarananda Kalakshetra comprises of top ranking professional musicians who are also concert musicians in their own right. These artistes bring their talent and creativity; dedication and commitment to make an extraordinary core ensemble that embellishes every creative presentation of Shankarananda Kalakshetra. IV Renukaprasad IV Renukaprasad, has been with Shankarananda Kalakshetra since 2003. An excellent Mridangam player, trained by Sri Sudarshanachary, Renuka Prasad is an outstanding Nattuvannar, known for his rich voice modulation for rendering Jathis and Konagalu. He plays the Nattuvangam for both Kuchipudi and Bharathanatyam styles of performances, maintaining their inherent differences intact. 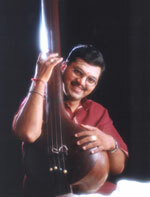 A prolific composer of Jathis, (numeric and mnemonic formulations that accompany pure dance) Prasad’s compositions are much sought after by leading dancers. Satthiraju Venu Madhav Satthiraju Venu Madhav, a bright and rising star on the firmament of Carnatic Music is a disciple of Sri D Raghavachary Garu (Hyderabad Brothers) He has also had advance training in music from `Sangeetha Kalanidhi’ Sri Nedunuri Krishnamurthy Garu. A well known solo concert musician, Venu Madhav continues to wow audiences for his rich and deep voice and inherent creativity. A rare solo musician and a dancer’s musician, Venu Madhav is known for his perfect sense of sruti and laya, while laying emphasis on the bhava and rasa of the raga and song. A creative musician, Venumadhav composed Annamayya Padamandakini consisting of 108 unheard and rare kirthanas of Sri Thallapaka Annamayya, tuned in 108 different ragas and sung by Venumadhav. 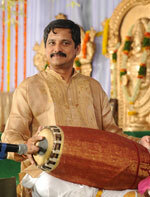 Venumadhav has been a key team member of Shankarananda Kalakshetra for more than a decade. T P Balasubramanyam T P Balasubramanyam has been a part of Shankarananda Kalakshetra, from a very young age, when he started providing percussion support for programmes of Shankarananda Kalakshetra. 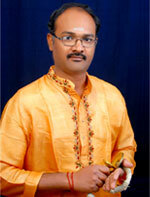 A disciple of Shri SV Satyanarayana and Nemmani Somayajulu, Balu as he is fondly called is an active Mridangam and Ghatam player on the Carnatic music circuit having accompanied stalwart musicians like Hyderabad Brothers, Malladi Brothers, Sri Nookala Chinna Satyanarayana, Sri Puranam Purshotham Sastry and others. He is an integral and essential part of Shankarananda Kalakshetra and provides the rich and resonating percussion that signifies all of the institutions dance productions Balu has toured with the Shankarananda Kalakshetra widely in India, and overseas. 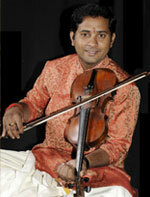 Kolanka Sai Kumar Kolanka Sai Kumar is a very popular violinist both on the music and dance circuit. Born to well known Mridangam player Shri Kolanka Laxman Rao, Saikumar trained under the well known Shri Peri Sree Rama Murthy. He has been an important part of the Shankarananda Kalakshetra ensemble adding the beauty of his violin playing to the dance, impressing the audience with his creativity and control over the instrument. He tours regularly with Shankarananda Kalakshetra, even as he continues to perform as a soloist and as a duo with his brother Anil Kumar on the Carnatic Music circuit. 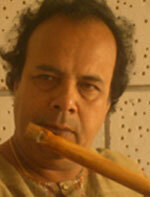 J Dattatreyulu J Dattatreyulu, is a well known and much sought after flute player, who is known on the classical music and light classical music circuits. A graded artiste of All India Radio, Dattatreyulu, is also a well known solo flute artiste performing regularly on the concert circuit.